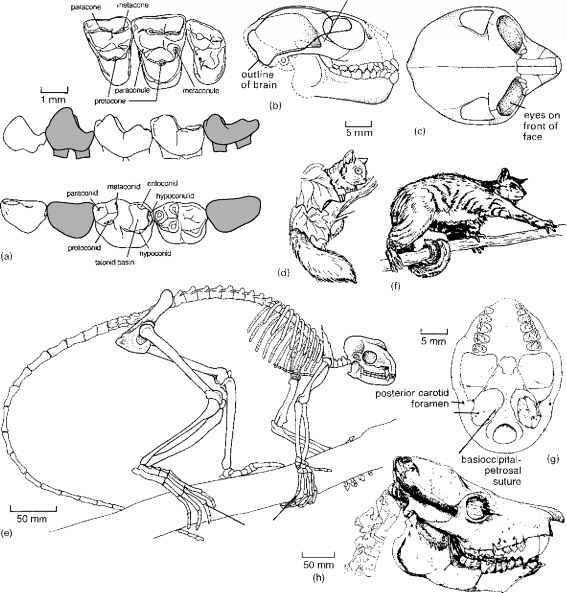 The development of living vertebrates and basal chor-dates indicates a great deal about their ancestry. Embryos may be sliced thinly on a microtome, rather like a mini salami-slicer, and three-dimensional reconstructions are made from tracings of the thin-sections by computerized methods. In addition, and most importantly, studies of the genome allow developmental biologists to relate specific anatomical structures to genes. In many cases, they have found that genes that code for particular organs or functions are shared among widely different species that may have had enormously long independent histories. So, hypotheses of homology between organs can be tested by identifying shared genes, and recent work on amphioxus has been remarkably informative (see Box 1.3). New work on amphioxus has given clues about the origin of vertebrate characters, particularly the head. Amphioxus, the classic cephalochordate (Figure 1.3) looks superficially like a rather simple fish, but it lacks the vertebrate hallmarks of a true head with well-defined sensory organs and the three-part brain (see section 1.5). So how could the head and the sense organs and the three-part brain have arisen from the basal chordates? Anatomists have for a long time sought evidence for homologies between the cerebral vesicle of amphioxus and the three-part brain of vertebrates, the frontal eye of amphioxus and the paired eyes of vertebrates and other such structures. New studies by three developmental biologists, who rather confusingly share the homologous surname of Holland —Linda Holland and Nicholas Holland (both at the Scripps Institute of Oceanography, San Diego) and Peter Holland (at the University of Oxford)— have revealed amphioxus homologues of developmental genes on the basis of amino acid sequences of conserved regions (Shimeld and Holland, 2000; Holland and Chen, 2001; Holland and Holland, 2001; Holland etal., 2001). It turns out that developmental genes show remarkable conservation across a wide range of animal phyla—in sequence, expression and in function. In other words, when the Hollands sequence particular segments of the chromosomes of amphioxus and of vertebrates, they find the same genes, and the genes appear to express themselves in comparable parts of the body, hence pointing to potential homologies. There are many examples of such shared developmental genes. 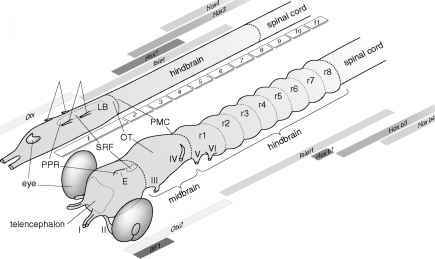 The expression patterns of amphioxus homologues of the genes called Distal-less, Otx, Hox-1 and Hox-3 have indicated that the amphioxus nerve cord, which has no obvious divisions except for a slight anterior swelling, has counterparts of the vertebrate forebrain and hindbrain. Expression of the genes Pax-1, Pax-2/5/8and Brachyuryhomologues has supported the homologies of amphioxus and vertebrate gill slits and notochord. So even though amphioxus adults have a very simple brain, and simple sense organs (the 'eye spot'), the genes are shared, and phylogenetic precursors of vertebrate brain regions, eyes, and other organs are there in amphioxus. Even that most typical of vertebrate organ systems, the skeleton, has its gene and morphological precursors in amphioxus. Most importantly, amphioxus shares embryonic cells that are homologous with the neural crest of vertebrates. The neural crest was thought to be a unique developmental feature of vertebrates, and indeed it is a developmental precursor of virtually all the distinctive vertebrate characters. The neural crest starts as a group of cells that forms on either side of the developing spinal cord and migrates to all areas of the body, providing the starting point for much of the head and face, and contributes to many other parts of the body such as the skin, nervous system and limbs, producing the cranial nerves, the fin rays, the pharyngeal gill skeleton, and other key vertebrate characters. The genes distal-less, snail, Pax-3/7and Msxare expressed in migratory embryonic cells of amphioxus as well as in the neural crest of vertebrates, so the gene homologies point to morphological homologies, and indicate the evolutionary source of the neural crest. http://anatomy.med.unsw.edu.au/cbl/embryo/Notes/ncrest.htm, and the song 'It's a long way from amphioxus', sung to the tune of 'It's a long way to Tipperary', with audio performance, at http://www.flounder.com/amphioxus.htm. larva failed to metamorphose and became adult (i.e. re-productively mature) as a swimming larval form. This elegant theory, however, is rejected by recent molecular phylogenies of tunicates that suggest their developmental characters are unique and did not give rise to the vertebrates.